June 2013 was another great month in closed sales in the Monroe CT real estate market with a 50% INCREASE in sales as compared to June 2012 . 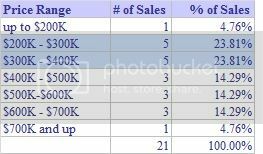 However, average list and sales prices decreased slightly at 4% and 2% respectively. The median home price average was down 7%. 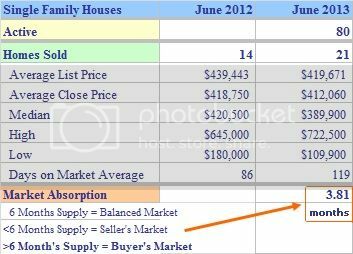 The market absorption is down to 3.81 months meaning it would take 3.81 months to sell off the present inventory placing Monroe statistically in a seller's market. Futures remain strong with 33 houses under deposit and 19 properties under contract. Which houses attracted buyers and sold in Monroe CT in June 2013? The absorption trend, which shows the number of months it would take to sell the entire inventory at the same pace, came in at 3.87 for the last three months, which, as stated above, statistically is defined as a seller's market. Monroe needs inventory! Keep in mind that this rate is for ALL houses. If you are selling your home, your agent should calculate the absorption rate trend for your price point to get a more accurate analysis. The sweet spot of the usual $300-400k price range had some competition for top billing with the lower $200-$300K range which drove the averages down slightly. Remember, each month is a snapshot of the month including all sales. Individual price ranges and results will vary which will determine a correct listing price or amount to offer on a purchase. 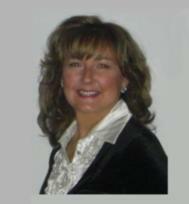 Date Source: Greater Fairfield County Multiple Listing Service -- July 14, 2013 . No representation or warranty is made to the accuracy of this information. Trumbull CT FREE Summer Concert Schedule 2013 - Toe Tapping Tuesdays!